February 1, 2013 -- The hunting gear has been stowed until next fall, and that means Steve Torrence will soon embark on another exhilarating endeavor – continuing his pursuit of NHRA’s Mello Yello Drag Racing Series Top Fuel championship. While he thoroughly enjoys his yearly hunting visits to southern Texas, it doesn’t compare to the overall satisfaction he is seeking in the 24 races that lie ahead. This is down-in-the-trenches, team vs. team action where winning smiles are preferred to forlorn frowns and the eventual winner takes home a check for $500,000. 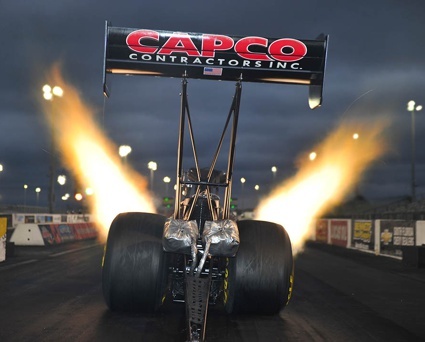 “I am getting pretty excited about starting the 2013 season,” said Torrence, the owner/driver of his family’s Torrence Racing/Capco Contractors Inc. dragster team. In its first season, he produced an imposing three victories in five final rounds and claimed two top qualifying positions. He finished ninth in points and was the lone one-car team to make the coveted top 10. Once again, he and crew chief Richard Hogan are devising various approaches to compete against the multi-car teams that have been dominating the category’s top 10 standings. “They definitely have the advantage when it comes to gathering important racing data,” Torrence pointed out. “We found that out the hard way in the Countdown (to the Championship six-race showdown),” when an unexpected clutch disc problem precipitated a slide from fourth place to ninth. Torrence will join a stellar list of drivers – including Antron Brown, last year’s champion, runner-up Tony Schumacher and fourth-place Shawn Langdon – in Pomona, Calif. for the beginning of what may be one of the most intriguing and competitive championship chases in years. NHRA’s new Mello Yello Drag Racing Series launches its first of 24 races in the traditional 53rd annual O’Reilly Auto Parts Winternationals, Feb. 14-17, at Pomona. The series makes its first stop at Epping, NH, for the New England Nationals, June 20-23.